The final countdown has begins today! 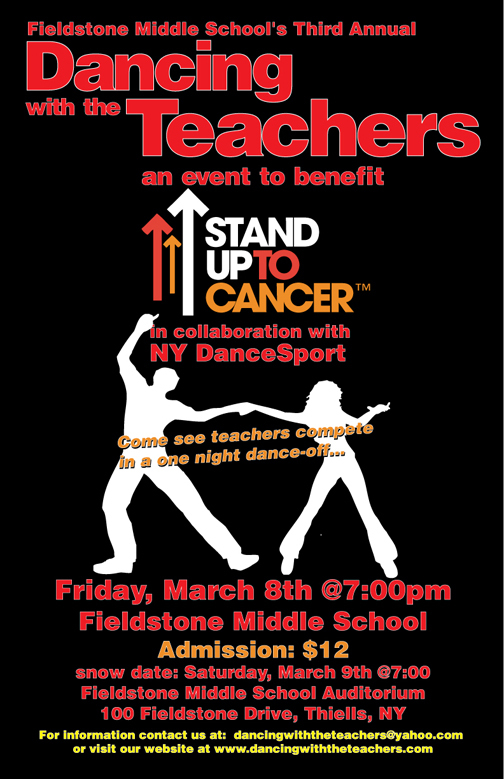 It is exactly one month to the day until the curtain opens on the third annual Dancing With The Teachers: An Event to Benefit Stand Up To Cancer on Friday, March 8th. It has been a whirlwind week of preparing for DWTT 2013. Exciting news began week the as Fieldstone Middle School was honored to hear that Katie Couric, co-founder of SU2C, chose to feature Dancing With The Teachers in her blog on World Cancer Day. Feeling inspired, Mrs. Harrington and Ms. Leibel took pictures with “Stand Up” signs and posted on the Dancing With The Teachers DWTT and Stand Up To Cancer facebook pages on World Cancer Day. During every free minute they had, the students in the Builders Club were hard at work making posters and preparing for the upcoming fundraisers. Our ESL and Bilingual students made flower pens and candy cane grams to sell on Valentine’s Day. Playbill advertisements continue to pile in to Mrs. Sassone, and Mrs. Ryan has been collecting T-shirt order forms. Mrs. Reilly has been busy editing video clips for our show. The halls of Fieldstone have been buzzing about a surprise project Ms. Brand and Ms. Young have been secretly working on. Did someone say blizzard? The expected foot of snow has caused the faculty vs. student basketball game to be rescheduled for Friday, February 22nd at 7:00 in the FMS gym. The alumni dance rehearsal also had to be postponed until Sunday, but we “Will Survive”! And of course, all of our current contestants have been practicing their routines with Igor and Nolan at NY DanceSport and the competition is fierce! Stand Up To Cancer has been in constant communication with us and continues to express their gratefulness for what Fieldstone and the North Rockland community is doing to support the cause.